If you'd like a big two-door car with a long hood and short deck, the Monte Carlo is one of only a handful still in production. The V6 gives good performance and fuel economy, and the front-wheel drive provides good traction in the snow. If you need a coupe with a usable back seat, the Monte Carlo's got your name written all over it. Silver 2007 monte Carlo 3. 5 l engine. 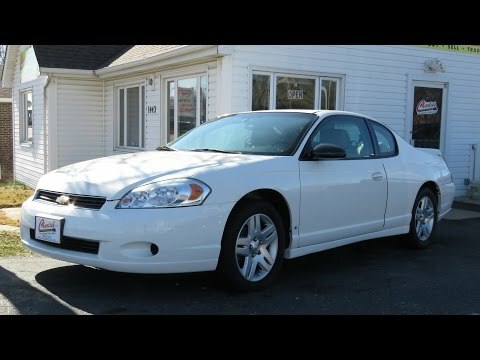 I enjoy my monte Carlo it is a comfortable car with a balance between comfort and performance. There is a decent 3. 5 liter engine under the hood that can put out some nice power. The suspension is a mix between loose and tight but more on the loose side. My monte Carlo is a cool silver color that is different from most other silvers you see on the market. Overall I have not had any major problems with the car only basic maintenance like tires and brakes. However, the exhaust mid pipe and resonator had o be replaced after 10 years which is not unreasonable. I have never broken down in this vehicle, it has proven to be consistently reliable. This version of the monte does not have many features just basic things. One complaint about the features is the power windows only works for the driver side and only going down, not up. Mama black is the name I call my car because she is so good to me. It is black and really comfortable it rides sooth and rarely needs repair on anything. I have had it for a while and I love it I appreciate my car a lot. It was between that or a red car so I picked the best suit for me because black is my favorite color. Everything in it was new and it is gotten me to a lot of places.